I will send the accounts usually within 1 hour. 3- log in with your main account and play online. 2- set the account as primary. You are in an unsupported region - you will need to change your region on your Xbox to the United Kingdom or United States. Platform: Xbox One/Xbox 360. THERE ARE NO EXCEPTIONS TO THIS. You are currently using a trail - it must be expired. You are in an unsupported region - you will need to change your region on your Xbox to the United Kingdom or United States. Platform: Xbox One/Xbox 360. THERE ARE NO EXCEPTIONS TO THIS. MAXIMUM OF 1 CODE PER PERSON PER 48 HOURS. I will send the accounts usually within 1 hour. 2- set the account as primary. Enjoy unlimited access to over one hundred great Xbox One and Xbox 360 titles. Platform: Xbox One. Region: Worldwide. THERE ARE NO EXCEPTIONS TO THIS. INSTANT DELIVERY received within seconds of payment! Compatible with Xbox One and Xbox 360. Codes do not stack. You must wait until the trial expires before you can redeem the other one. 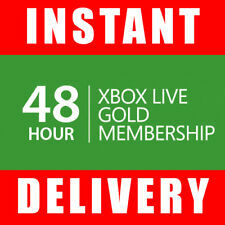 INSTANT DELIVERY 24/7 received in seconds of payment! Darth Malagus. Tulak Hord. Server: Any EU SWTOR server. The Leviathan. Amount: 200,000,000 credits (200M). Trade location Empire or Republic Fleet. 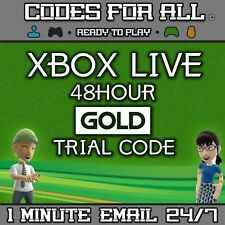 Xbox Live 48hr GOLD Trial Code. for Xbox 360 or Xbox One. To use an Xbox Trial code you also might need to change the region on your Xbox to the United Kingdom/United States or Canada. Instant dispatch! Log in with your main account and play online. Compatible with Xbox One and Xbox 360. Region Free - Works on any country your Xbox Live account is based. Codes do not stack. You must wait until the trial expires before you can redeem another one. Steam Gift Card £10 GBP. Platform PC / Steam. 5 Funds will be added to your Steam Wallet. 1 Launch Steam and login to your account. This is aSteam KEY. The Global Digital Marketplace. We are obliged to safe all your personal data and protect them from external interference. You may do that without disclosing information about your credit card.PlayStation Network card is a protected code consisting of 12 marks which adds money to your account’s virtual wallet. Value 10 GBP. Platform Xbox One / Xbox 360 / Xbox Live. Build your gaming legacy. 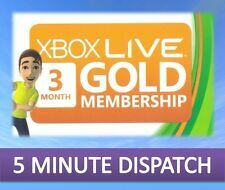 With Xbox Live Gold, you're part of the world's premier gaming community. With over 1 billion multiplayer matches played each month, Xbox Live is built for performance, speed and reliability. At the very end of the setup process, you may be asked to set the account to primary. 24/7 Local Support, Fast Dispatch, Legal & Safe ! 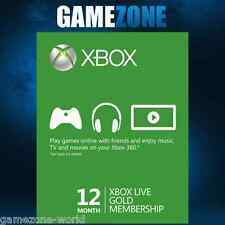 Enjoy unlimited access to over one hundred great Xbox One and Xbox 360 titles, including fan-favorites like Halo 5: Guardians, P.
You may do that without disclosing information about your credit card.PlayStation Network card is a protected code consisting of 12 marks which adds money to your account’s virtual wallet. Value 50 GBP. Fast delivery via eBay message (ebay and PayPal don`t share your email address anymore). 100% checked and working. it’s region free so will work worldwide. My feedback speaks for itself. As it is a digital content I can not accept any returns or refunds. Due to security reasons only one code per customer. (They don’t stack anyway). You currently have gold (wait for gold to expire then use). YOU MUST WAIT UNTIL THE TRIAL EXPIRES BEFORE YOU CAN REDEEM ANOTHER ONE. REGION FREE - WORKS ON ANY COUNTRY YOUR XBOX LIVE ACCOUNT IS BASED COMPATIBLE WITH XBOX ONE AND XBOX 360. IN CASE OF INVALID CODES (E.G. : TYPOS), THE CODE WILL BE REPLACED WITHIN 2 HOURS OR LESS. Compatible with Xbox One and Xbox 360. Region Free - Works on any country your Xbox Live account is based. You will need to change your region to USA, UK or CANADA. Codes do not stack. You must wait until the trial expires before you can redeem another one. To use an Xbox Trial code you also might need to change the region on your Xbox to the United Kingdom/United States or Canada. for all Xbox Platforms. Instant dispatch! You will be notified and provided with instructions on how to complete the procedure. This DLC add-on includes the following ONLY DLC PREORDER. -Deluxe Weapon: "Samurai Edge - Jill Model". -Deluxe Weapon: "Samurai Edge - Chris Model". Play online with Gold. Gaming on Xbox One is better with Xbox Live Gold. 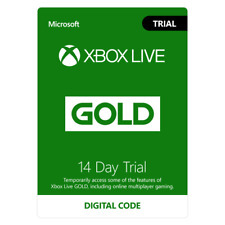 1 x 48 Hour Trial Code. Trial periods DO NOT accumulate. You have to wait for the code to expire to add another one. Your account WILL NOT turn Gold. Star Wars The Old Republic 50 Million ( 50000K ) ( 50.000.000 ) Credits For All EU Servers. Fast and Safe ! B, Empire or Republic ;. Fantasia Phial of Fantasia x 1. The miraculous phial of Fantasia grants you an opportunity to edit your character's appearance in any fashion you desire. Fantasia / 1. A wondrous item for the ultimate makeover! Steam Gift Card £20 GBP. Platform PC / Steam. 5 Funds will be added to your Steam Wallet. 1 Launch Steam and login to your account. This is aSteam KEY. The Global Digital Marketplace. We are obliged to safe all your personal data and protect them from external interference. Platform PC / GW2. Guild Wars 2 takes place in the high fantasy world of Tyria, 250 years after the defeat of the Great Destroyer in the Eye of the North expansion. The role of the player is to reunite the disbanded Destiny's Edge, a multi-racial adventuring guild, whose combined strength is needed to effectively combat Zhaitan, the undead Elder Dragon.